"New FREE Touch Screen Upgrade with 3D Customer Interface"
CAVS JB-199 II Server Digital Jukebox connects up to 9 regular / client JB-199 players serving as a central song data base for all. It is ideal for the multi karaoke rooms (KTV) where managing one central data base can reduce time and cost. CAVS JB-199 II Server Digital Jukebox comes with Windows XP Professional OS, upgraded from CAVS JB-199 II Premier unit. It has the digital advantages of storing more than 100, 000 songs and sharing them via network. It manages up to 10 (9 +1) rooms simultaneously with exceptional level of performance and reliability. CAVS JB-199 II Server Digital Jukebox, like a CAVS JB-199 II Premier unit, is a dual screen karaoke player that displays independently the control panel and the sing-along lyrics. The control panel, separated from the lyric screen, gives at all times the full access to the enhanced karaoke functions such as multiple song lists, managing reserved songs, real-time song search, drag & drop play, instant replay with variable time position, etc. CAVS JB-199 II Server Digital Jukebox also has an open architecture which supports CD+G, Super CD+G, AVI, and WMV song files which can be imported from discs or hard drives. It is also capable of importing the songs of JB-99, JB-199, and JB-199 II. For your karaoke sing alongs, it can record as well as write in real-time onto blank discs. CAVS JB-199 II Server Digital Jukebox has recently added a new networking feature with E-Songbook that replaces both the paper songbooks and the remote controls. Imagine "No More Printing Paper Songbooks" and "No More Appending Pages". E-Songbook is a Android Touch Screen tablet that automatically imports the song list from CAVS JB-199 II Server unit using Wi-Fi, and enables Search, Select, and Play of the songs from its touch screen. For details, go to E-Songbook. For those who have smart phones or tablets, such as iPhone, iPad, or Android, you can also download free Apps and connect to JB-199. You can Search, Save and Reserve the songs in JB-199 directly from your devices. For details, go to CAVS Reservation System. CAVS JB-199 II Server Digital Jukebox supports Touch Screen monitor with 3D Customer Interface. The 3D Customer Interface provides easy access for the Host as well as Customers to all songs. You can scroll, sort, and search instantly without the paper song books. For detail instruction on how to install and operate, please go to Touch Screen/3D Customer Interface. Do you need more than one touch screen to provide multiple access points for your customers? Please remember that for all JB-199 players, you can also use the wireless E-Songbooks, iPhones, iPads, and Android devices to see the songs and reserve paperlessly. CAVS JB-199 II Server Digital Jukebox comes with an option to encrypt the song content inside the player such that no other player and no other computer can use the data. Such protection is possible by attaching hardware specific data onto each song files. The protection requires a USB key lock that can be purchased directly from sales@cavsusa.net. CAVS JB-199 has many song packages to start you off immediately for your karaoke show. The song packages from CAVS, Chartbuster, Disney, and Stellar Records contain up to 6,000 songs of Pop, Rock, Country, Blue, etc., at bargain prices. Visit Song Packages for details. Dual screen mode with independent KJ Control Panel and Lyric display. Encryption of song content for protection against copying / exporting. * Requires optional disc drive. ** Requires optional USB camera / RCA to USB Video cable. Note: This upgrade is for JB-199 II Server / Premier or Dual Screen JB-199 II player. For Single	Screen JB-199 II player, go to JB-199 II homepage. How many JB-199 can be connected as client? Total of 9 JB-199 units can be connected as clients. Can you also use the server unit as a player? Yes, JB-199 Server can be used as a player to cover a room, just as a client. How do you play songs simultaneously from 10 JB-199 units? It is like having 10 JB-199 units with songs in each of their hard drives. Except in Server-Client version, only the JB-199 Server will store the songs in its hard drive. All other JB-199 Client units will share the songs from the Server. You can play the same or different songs at anytime from all of the JB-199 units. I already own JB-199 unit(s). Can it become a client? Or server? Yes, any JB-199 can become a client with software upgrade and proper setting change; however, for JB-199 Server, your unit is likely to need hardware upgrade from the factory. Could you move song library from existing JB-199 to JB-199 Server? Yes, if you already own a JB-199, you could transfer its songs to JB-199 Server. For detail, refer to page 10 in the User Manual. 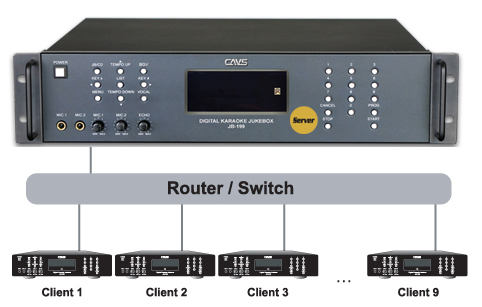 What type of router or switch is needed for Server-Client connection? Any standard router or switch is acceptable as long as it is 10/100 Mbps Ethernet compatible and have the number of ports at least equal to the number of JB-199 Server and Client(s) combined. What is the benefits of having Server-Client configuration rather than multiple JB-199 units? First, there can be considerable money saving from having to purchase a single copy of songs rather than multiple copies. Second, there can also be time saving having to manage a single data base of the server rather than multiple data bases. Who is the JB-199 Server-Client version intended for? The Server-Client version can be effectively incorporated into restaurants and bars with multiple karaoke rooms or booths. It would also be suitable for hotels and cruise liners where karaoke needs to be available in more than single locations.